Buy in bulk to have wholesome, nutritious, locally-grown meat at your fingertips every day. Save money and time by purchasing beef (1/8, ¼, ½ or whole), pork (1/2 or whole) , lamb (1/2 or whole) and chicken directly from us, the farmers who raise your food. Chicken is usually in stock year-round so you can have it within a week or two of purchase. Pork is ready monthly. Demand for our grassfed beef is at an all-time high so there is a wait list for beef, with orders made now being filled in June. Volume lamb is offered August through April, contact us for availability at other times. Just click here to get started: Beef Buy now, Pork Buy now, Lamb Buy now, Chicken Buy now. You can pick up your meat at our farm store Monday-Friday 8-5 and Saturday 8-2. For the Terre Haute area the farmer's market is inside Meadows Shopping Center right along Poplar Street from 9-1. 2019 spring market dates are March 2nd and April 6th. Our meat is also available at the White Violet Center Mon.-Fri 11-6 and Sat & Sun 11-2. The next Broad Ripple delivery will be March 9th from 9-10 am (at 61st Street and Crestview Ave just south of BRHS) . Next delivery for Fishers (at the northwest corner of 116th and Allisonville in the Kroger and Pets Supply Plus parking lot) will be March 9th from 11 am-noon. 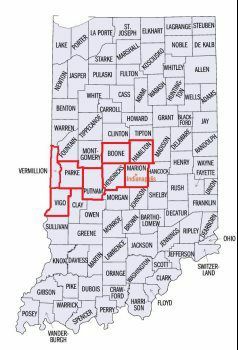 Delivery of your bulk order is an option in Marion, Hamilton, Boone, Hendricks, Putnam, Parke, Vermillion and Vigo counties. Contact us to learn more. If you live somewhere else in Indiana, give us a shout, you never know when we might be in your neighborhood! Individual 1-3# packages of beef, pork, lamb and chicken are sold at our farm store, farmers markets and winter pick up locations.